We managed to accumulate a lot of eggplants this week - good deals at the market that we couldn't refuse. Since I seem to have a soup thing going, I decided to combine the eggplant with the soupathon and make roasted eggplant and garbanzo bean soup. I'd been wanting to make this ever since I first got my hands on Love Soup. 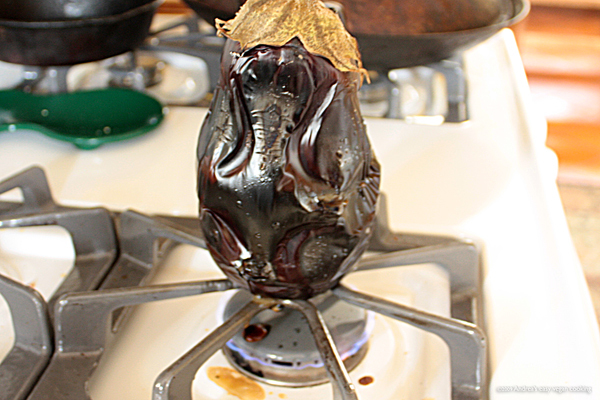 I also wanted to try roasting an eggplant on the stove top (gas stove) like our cooking class teacher did. I mean, I've roasted peppers on the burner, but an eggplant is so much bigger. I roasted one eggplant in the oven and one on the stove burner. And I made quite a mess on the burner. But now that I've roasted another eggplant (story below) I know what I did wrong the first time. I kind of ignored my roasting eggplant a little too long on a flame that was a little too high, and by the end I was certain I was going to set off the smoke alarm. By the time I remembered to turn the eggplant there was goo oozing out and turning to charcoal all over the burner. I got the eggplant cooked, but yuck, what a mess. I used a scrubber to VERY CAREFULLY clean the burner while it was still hot and everything came off in a snap so it turned out not to be so bad, but it can be better. We combined the two eggplants for the soup because I was hoping to give the soup an edge of smokiness, but the soup just tasted like regular oven-roasted eggplant to me. The soup was delicious, but I could have saved myself some trouble by just using the oven. For eggplant roasting experience number two, I played smarter. 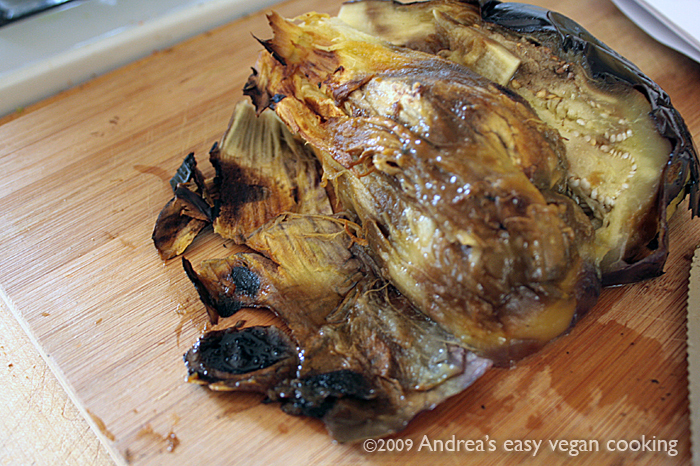 I turned the eggplant often so it would char evenly rather than get too cooked on one side and burst. The whole thing only takes about 15 minutes so there's no excuse for not sticking close by and doing it right. The flame was on the lowest simmer. The hardest part is cooking the thicker bottom but setting the eggplant upright for a couple of minutes did the trick. There was still a small spill but nothing like the first one. When the eggplant was soft, I set it in a bowl for a while to drain out the bitter fluids, and cool a bit. The next part involved cutting it in half and scooping out the flesh, carefully retrieving all of the eggplant that was clinging to the charred skin. This was easy, easy. Next I used my chef knife to chop the eggplant into a purée, which I mixed with tahini, lemon juice, sea salt and finely minced garlic to end up with baba ghannouj - smoky and fabulous, just like it should be. I think this is the only way I want to have baba ghannouj from now on. Oooooh yummy looking Baba ghannouj! I've roasted peppers like this but not tried aubergines! 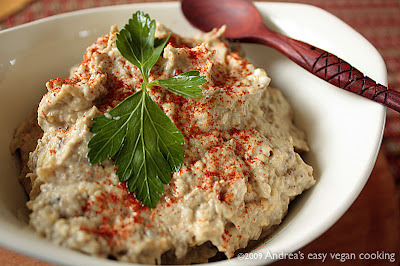 That baba ghannouj looks amazing! I have tried both methods of cooking eggplant or subergine as we call them and I didn't notice a remarkable difference in the flavour either. It is much less fuss to do them in the oven, I think. Woah. I LOVE baba ghannouj and yours looks incredible. I will have to try this method for roasting eggplant. Thanks! The smoky flavor made all the difference in the baba ghannouj but not in the soup. Less fuss for sure. But I did get the smoky taste. The proper way to do it is outdoors on a grill! I hope you like it. I'm going to do it again in spite of the clean up. Yum, yum, yum! That soup sounds excellent. I wanted to grab an eggplant yesterday but it was sold out. I hope I can make this soup next week! I'd like to try your stovetop eggplant roasting experiment in the next day or so. Did you puncture it with a fork before roasting, like one does with the oven-roasted version? Thanks! I'd like to see what recipe you come up with. Or are you using the soup book? Nope. Just make sure to turn it a lot and keep the lowest possible flame - one that doesn't touch the eggplant.